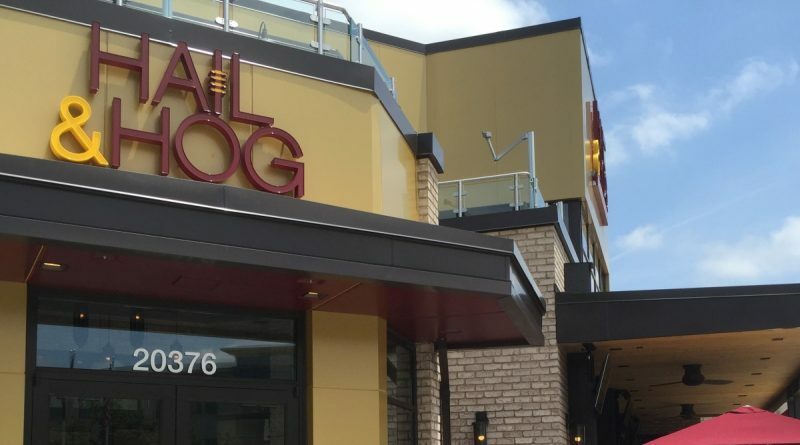 Named in honor of the Washington Redskins’ famed run-pushing offensive line, the Hail & Hog Kitchen and Tap in Ashburn isn’t off to a fast start. The football-themed restaurant opened in June on a prime corner on One Loudoun’s main street. On Tuesday, the owners filed for federal bankruptcy protection. The Chapter 11 filing seeks to restructure debts with creditors, including the construction contractors. The restaurant will remain open while those talks continue. The company listed assets and liabilities of between $1 million and $10 million. Hail & Hog is the latest NFL-themed eatery opened by the G.R.E.A.T. Grille Group, which also operates Eddie George’s Grille 27 in Columbus, OH; Jerome Bettis’ Grille 36 in Pittsburgh, PA; the Colts Grille in Indianapolis, IN; and the Houston Texans Grille in Texas.